The whole way through reading this book, I was thinking how much my husband (who had read it before I did) must have loathed it. A man of scientific inclination, given to dot-points and resistant to ‘dumbing down’, he grumbles when a plot line in a crime show or a documentary becomes clogged up with relationship-type stuff. This book offends on both counts. Although titled Galileo’s Daughter, it is actually about Galileo and his discoveries and theories in astronomy, explained simply for the non-scientists among us, and framed through the letters that his daughter wrote to Galileo. 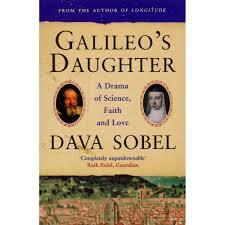 Galileo had three illegitimate children through the same woman. He was able to ‘buy’ legitimacy for his son, but to circumvent the disadvantages that illegitimacy and lack of dowry would confer on his two daughters, he placed them in a convent. If you’ve read Mary Raven’s Virgins of Venice, you ‘ll know that convents were used as a way of solving the dynastic problems of the Venetian (and other Italian state) noble families. If a girl could not be married successfully and strategically, then a convent provided a means of providing for her, and in a deeply religious society, bolster the family’s heavenly credit through her lifetime of intercession on their behalf. Convents were not necessarily stark, isolated experiences. They were often filled with educated, noble women who maintained an interest and knowledge of her family’s outside activities, albeit from behind a grille. Galileo placed both his daughters with the Poor Clares in the Convent of San Matteo in Arcetri, Florence. His eldest daughter, Virginia, took the name Suor Maria Celeste, while the younger daughter became Suor Arcangela. The book reveals the letters that Suor Maria Celeste wrote to her father, translated by Sobel herself, interwoven with a narrative of Galileo’s development of his astronomical theories and the resultant conflict with the Inquisition. Here is the historian’s lot writ large: a cache of letters from one party only. However, continuous archives like this, where the letters were frequent- and these ones certainly were- allow for reconstruction of the missing side of the correspondence. I was struck by the waste of this lively intelligence. Although Suor Maria Celeste’s writing is larded with expressions of deference and spirituality that don’t sit comfortably with us today, she was well aware of her father’s work and made good copies of his correspondence. She assisted him in more quotidian ways too: making repairs to his clothes, cooking jams etc. and making solicitous inquiries about his health. Certainly this convent was more straitened than those described in Virgins of Venice, with the nuns often going hungry and poorly served by the priests who ‘ministered’ to them. Although the story of Galileo’s clash with the Inquisition is well-known, Sobel argues that he was, and remained, a deeply religious man. But she also reveals the rather duplicitous manoeuvres that Galileo made to appear to conform, while ensuring at the same time that his controversial theories, so blasphemous in the eyes of the Church, reached beyond the Inquisition’s grasp. She creates a nuanced overview of theology, and Galileo’s challenge to it, and a clear (if rather simplified) explanation of his theories. I must confess that I preferred the letters to the science in the book, and felt tempted at times to skip over those sections. But I did feel genuinely saddened by the short and constrained life that this intelligent woman lived. I enjoyed the book, even if my husband didn’t. Read because: It was a bookgroup (Ladies Who Say Oooh) selection. I like the way you’ve achieved a kind of double critique here, one from your PoV and one from his!